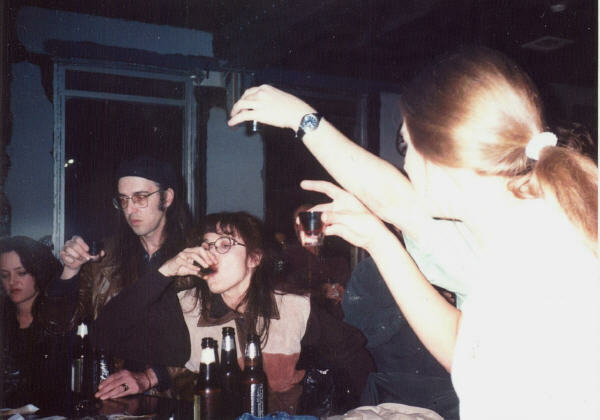 Erin “Scratchy” Hutter (at left), Tom Moran, Stephanie Vargo, and a profile shot of Erin Snyder. Tonight is Halloween, putting me in mind of past Halloween celebrations. 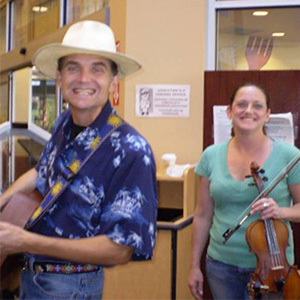 Some of the most fun ones I’ve had were spent in Pittsburgh at the end of the last century, when a few of us led by Tom and Stephanie of the Deliberate Strangers organized three annual music festivals: Twangburgh (in 1998) and the Haunted Hillbilly Hoedown (in 1999 and 2000). All three featured the Deliberate Strangers, as well as kindred spirits ranging from locals Coal Train and the Polish Hillbillies to national acts such as Jon Langford, the Drive-By Truckers, Dirtball, and Hazel Dickens. They were a lot of work, but also a delight to experience both for the music and camaraderie. Scratchy with her fiddle and Slim Forsythe. Erin “Scratchy” Hutter was a big part of these festivities. If you’ve listened to much music in Pittsburgh over the past twenty years, there’s a good chance you’ve enjoyed Scratchy play her violin, make spooky noises on her theremin, or contribute harmony vocals somewhere. Her tastes ran from traditional country to Nick Cave, evident in her black wardrobe and the variety of her bands. I first saw Scratchy play with the Deliberate Strangers opening for Robbie Fulks (at a sports bar in Shadyside, of all places), and over the years got to hear her play many shows with the Strangers, as well as alt.rock aggregation Boxstep and electric string quartet EQ (with namesake Erin Snyder) before I moved away in 2003. Scratchy sweetened the sound of all of these bands, and was generally a supportive part of the scene. Whether it was expressing concern for a concertgoer who had over-imbibed, or training with me at WRCT so she could showcase music from local bands, Scratchy made things better for the people around her. Scratchy died earlier this week at the far too early age of 48. Services are set for tomorrow morning, All Saints’ Day. I will always think of her at Halloween. Here’s a clip of her, Erin Snyder, and Slim Forsythe playing “Will the Circle Be Unbroken” from last year. Undertaker, please drive slow. This entry was posted in events, history on October 31, 2014 by Carl Zimring. Just found this post. Erin was my sister. Thank you for honoring her.